Cooking a turkey can be fairly simple, if you have a solid foundation. Any seasoned Thanksgiving cook will say that the secret is in prepping the turkey correctly and ultimately avoiding any overcooking which dries out the meat. Keep the kids busy with some fun Thanksgiving resources so you are free to follow these easy steps to cook turkey and make your Thanksgiving dinner a smashing success! Remember, a turkey kept in the display or freezer for long will not be the best starting point. Try buying turkey from a butcher shop because they generally sell fresh meat when compared to holiday meat displays at your local grocery stores. Additionally, you will want to avoid turkeys that have been injected with salt as it ruins the succulence of turkey meat. If a frozen turkey for Thanksgiving is your most realistic choice, just make sure that you thaw the bird to room temperature, before stuffing it. Make sure you discard the giblets from the inside cavity of the turkey. Rinse the turkey thoroughly under running water and pat dry before proceeding to season it – moist turkey will steam and the moisture will prevent the turkey skin from turning brown and crispy. Prepare the dressing or stuffing you want to use and fill it into the empty cavity of the turkey with a spoon. Fold the loose flap of the empty cavity and seal it well. While this is a common style of cooking, stuffing is optional as some chefs feel the stuffing draws moisture from the turkey’s skin, therefore drying out the meat. After you have stuffed it, prepare the brine with a salt solution that’s infused with spices, aromatic herbs, and fruits. 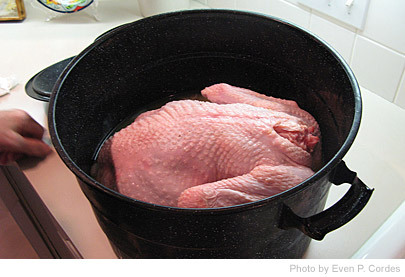 Use a large plastic bucket or a stainless steel stock pot so that it is easy to turn the turkey around while brining. You can avoid brining the turkey if you have purchased turkey that’s already injected with a salt solution. Preheating the oven before roasting turkey is an absolute must. Set the oven temperature at 450 degrees before you put in the turkey. 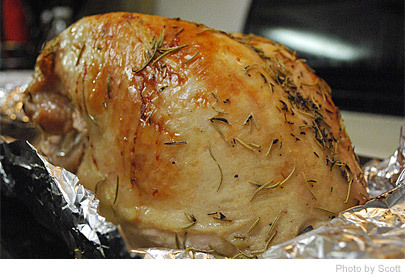 Cover the roasting pan with thick aluminum foil and wrap the turkey breast-side up in it to form a loose tent. This step ensures that the turkey retains its moisture and prevents the meat from drying out. 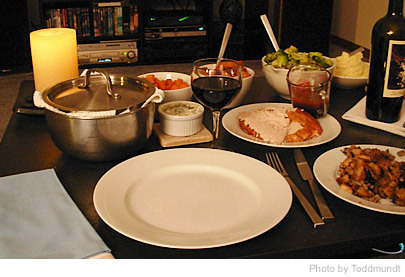 Average cooking time is 20 minutes for every pound of turkey, so weigh your turkey before roasting it. Bring down the temperature and roast the turkey at 350 degrees. Baste it, with butter and the turkey juices gathered on the bottom of the foil, every 30 minutes. Remove the foil from the breast and thigh during the last 30 minutes to get the desired color and crispiness. Use a meat thermometer, after your estimated time is reached, at the turkey’s thigh to see if it’s done – turkey will be at 165 degrees if it’s cooked. Rest the turkey for 45 minutes before serving it. Wrap it again in an aluminum foil, along with its juices to mellow the meat. Leave a gap in the foil for the steam to pass so that it doesn’t take away the crispiness. Carve the turkey using the same carving knife you use to carve a chicken. Serve the white meat and the dark meat on two separate plates and let your guests enjoy this traditional turkey at Thanksgiving dinner.